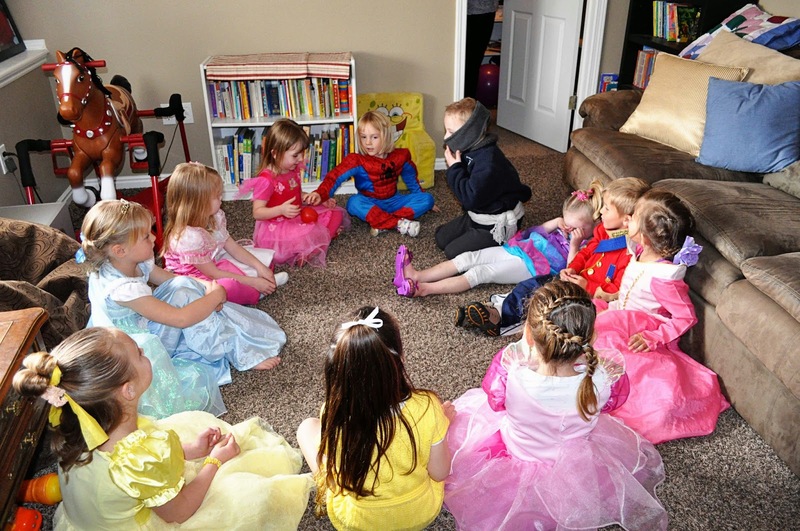 While there are a lot of photo ideas out there for a princess birthday party, there are very few posts full of all the info from a party from start to finish. Since I just did one for McKenna, I thought it might be helpful to some to get some full ideas. Let’s start with the invitation. 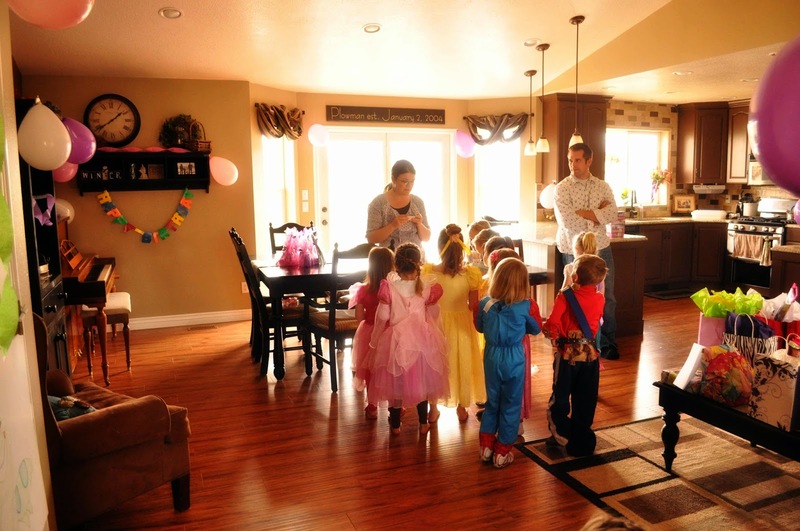 There are tons of ideas out there, so you can easily “google” or search on Pinterest for “princess party invitation” and find a lot of good ideas. Here is the I did for McKenna’s party. I googled for ideas and came up with this. 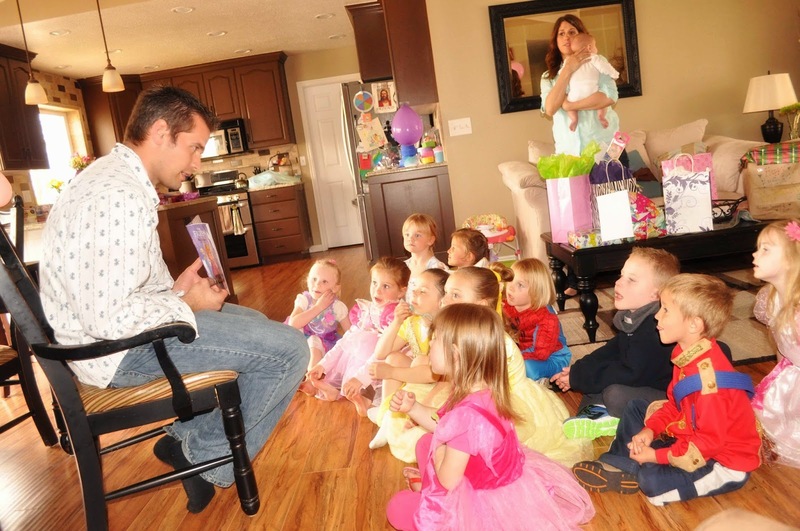 Like I said in my recent post on birthday parties, I have found a scavenger hunt type of party works really well for keeping a large group of children interested and engaged in what is going on. 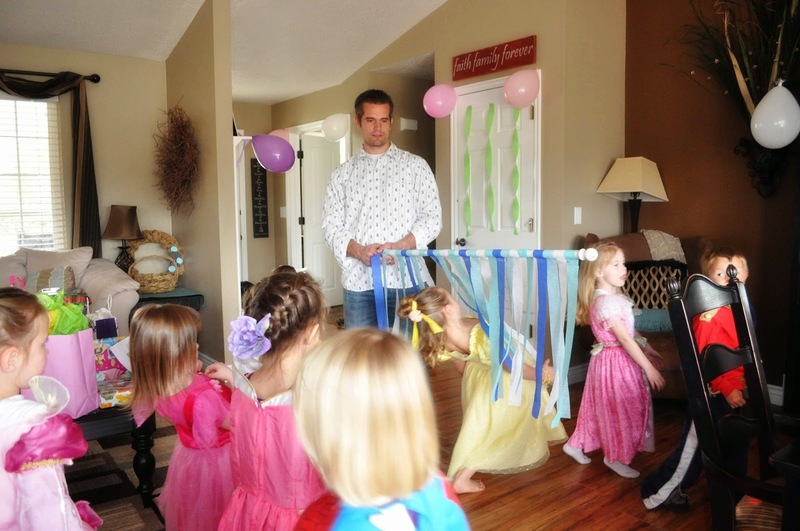 I searched for princess party games and made a list of all of the ones I thought looked fun. Then I made a list of all of the princesses. I chose a game for each princess. 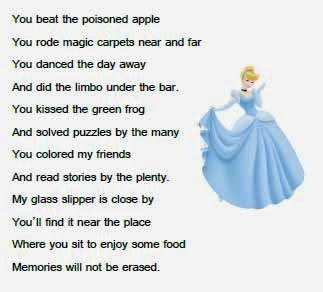 Then I wrote up poems to clue us in for which princess we would go to each time. As soon as the children were all there, we started our scavenger hunt. 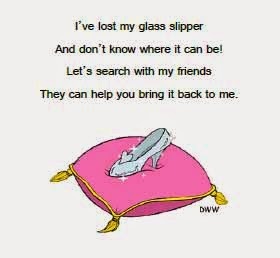 Our point was to help Cinderella find her lost glass slipper. 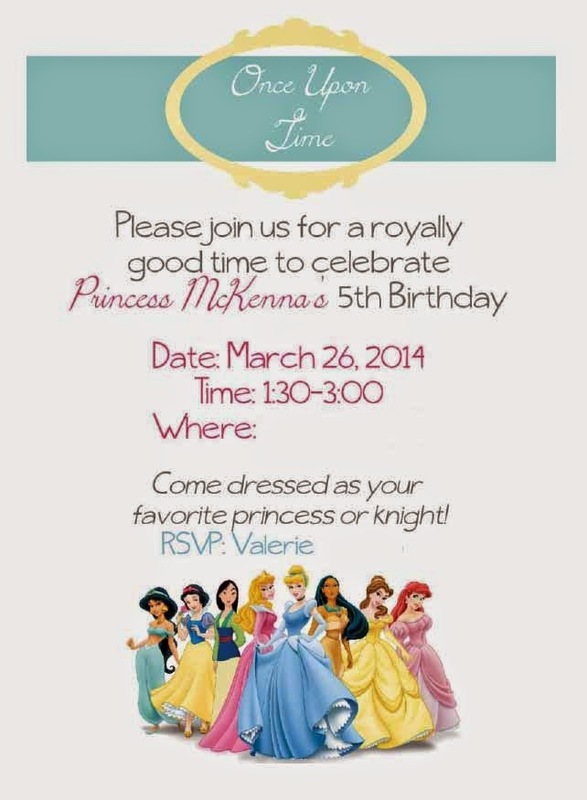 I did that because Cinderella is McKenna’s favorite princess. Just make sure you hide it somewhere the kids can’t easily see it. I had mine hidden on a chair right under that kitchen table, and they found it as soon as I read the introduction! Here is intro. Now that the suspense was built, I read the first clue. I put a picture on each clue so I could show the kids which princess it was after they guess (and so I could remember!). 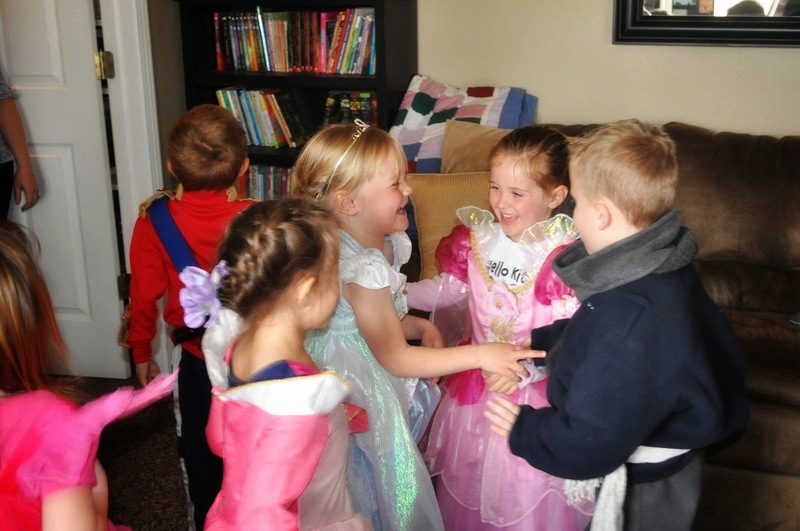 So I read the clue, then had the kids guess which princess it was, and then showed them the picture. We then went and played “poison apple,” which is like “hot potato.” I used an apple from our toy kitchen stuff. I downloaded some of our favorite Disney songs, put them on my iPod, and played the songs while they passed it around. Before the game started, we explained the rules and that if you had the apple when the music stopped, you fell “asleep” and were out of the game. I was sure to ask, “Is it a big deal if you get out? No. It is just part of the game.” We didn’t have any sore losers. We then played “Magic Carpets,” which is like musical chairs. I used pieces of fabric I cut into little rectangles. You could use rugs or doormats or those carpet sample mats. Fabric can be cheap if you don’t have anything that will work and are buying it. Again, I used the same playlist of princess songs (as a side note, I hid in the closet while running music so I wouldn’t favor anything toward McKenna winning). Oohhh the most anticipated princess! We then did freeze dance. This is done by playing a song and then pausing it. When the music pauses, you freeze and hold that position. Then you continue the music and then pause, etc. We of course did this to a song from Frozen and the kids all sang along. This one has no winner–just lots of fun. 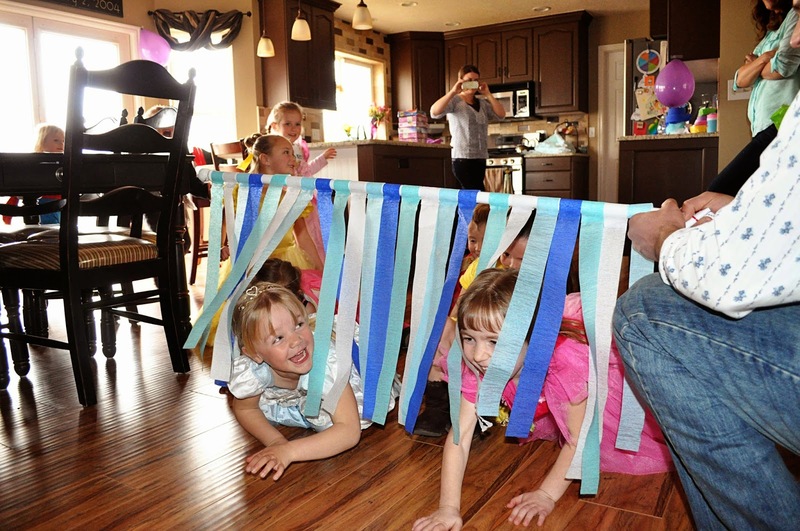 We then did “Under the Sea Limbo.” This was a huge hit. We used a dowel and hung blue streamers from it. I played the song “Under the Sea” as they did this. As the bar got lower, the kids started to crawl under it. We didn’t make a big deal about it. We didn’t have anyone sit out nor did we have a winner. They all had fun just going under the bar over and over. 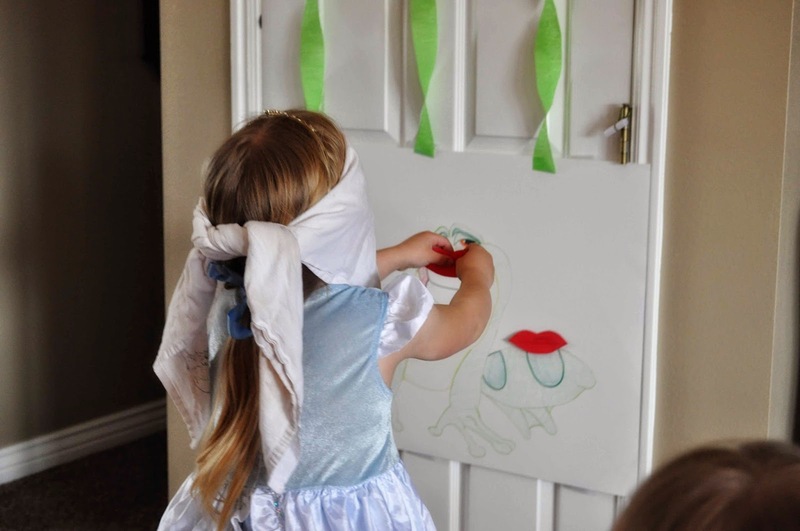 We then played “Pin the Kiss on the Frog.” I bought a poster board and my husband drew a frog on it. He is a good artist. Then I cut out a kiss for each kid plus some extras (you never know what will happen). We then put together puzzles. We have a bunch of princess puzzles, so we did those. You can find puzzles at the dollar store. We had the kids pair off and work together. I hadn’t looked closely at the puzzles and some were 100 piece and some were 25 piece. Oops. It didn’t end up being a big deal. When a pair got their 25 piecer done, we just said, “good job!” and ended the puzzle activity. 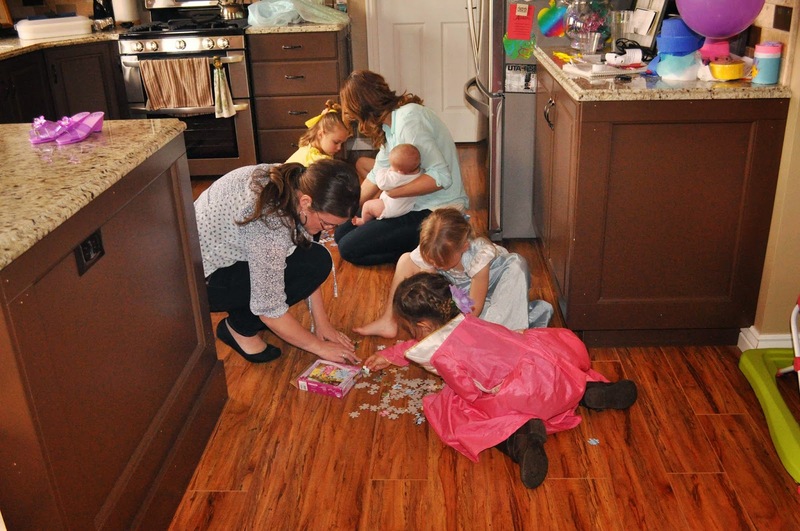 The grown-ups there helped the kids with the 100 piece puzzles, but they still didn’t get done. The idea here was to then color a picture, but we were running short on time, so we sent each child home with the picture I printed. I googled “Frozen coloring page” and printed off a page with each Frozen character in it. I thought about varying the pictures, but then I decided that would lead to some hurt feelings, so each child got the same picture. We then read a story. And that story was of course Frozen. Of course they already knew where it was so it was not difficult :). We then opened presents. We followed that up with cake and ice cream. I do cupcakes for kid parties. Around here, it is customary to send each child home with a small gift. We did a little favor bag you can buy at Walmart (I got ones that are pink with crowns on them). 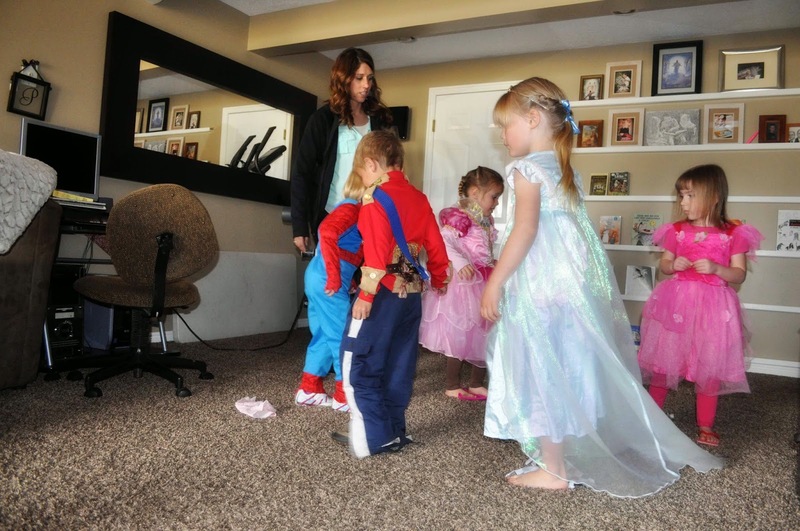 Inside we put a wand for girls, a glow-in-the-dark sword for boys, and bubbles for all. There you have it! If you want a copy of the clues, follow this link. We did 1.5 hours and it could have been 2 hours with the number of children we had and number of activities we had. You can cut games shorter if needed, but sending home the coloring page worked great, too.